Okay I can the vinegar thing for sure. I will move Henri into her outdoor enclosure and divide it in half for Duncan. So they will be side by side. Then I can neutralize the shed. Then I will reintroduce them in a couple days in the yard away from the shed, etc. I will continue to do this at small incruments until they accept each other. At that point they will move into the neuralized area but I will pen off the shed so it is a smaller space. And gradually increase the space as time goes on. And as long as they are bonding. Does that sound good? Graciee, OMG that was hard work! My shed is 10 x 12 feet and I washed all floors, walls, travel carriers, you name it with vinegar and water. I completely gutted the shed and sprayed everything down with vinegar plus vacuumed twice, washed all,the blankets. I even put up new curtains. Lol. 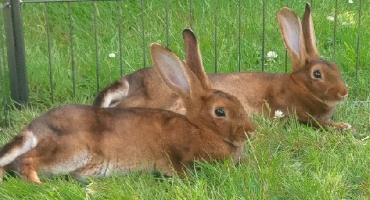 The buns are side by side in the outdoor enclosure now. And I will try again today or tomorrow to bond them in a pen I have at the end of my yard that I also washed and sprayed with vinegar. I got new litter boxes for the shed too. But of course they are using their old ones outside. They won't be allowed into the shed until they stop fighting. So I figure slowly I will let them have sessions in the pen and try to separate on a happy note, and then back into the outdoor enclosure but still separated by the wire divider. I honestly had no idea of the complexity of bunny bonding until now. I have always been so lucky in the past that my bunnies bonded easily. Lol good grief! Well, I don't know if it helps you but last year I successfully bonded a female (Willow) with a male (Charlie), breaking all the rules in the book - but it took five months. Rules broken: the female was not spayed, the male was introduced into what was completely her territory, I did not try to stress bond them. My method was quite simple: let them interact but stop them fighting and hurting each other. So whenever I was able to supervise them, I let them out in the garden and whenever they squared up to each other, I stuck a boom in between them. Their initial hostility died down gradually but it was an awfully slow process. I banked on the idea that (a) they probably preferred to live together than separately and (b) hating each other takes up too much energy. It worked, they have been together for a year now. You may not have the time though - for me it was a sort of hobby, running around in the garden with a broom, supervising rabbits, so I didn't care how long it would take.